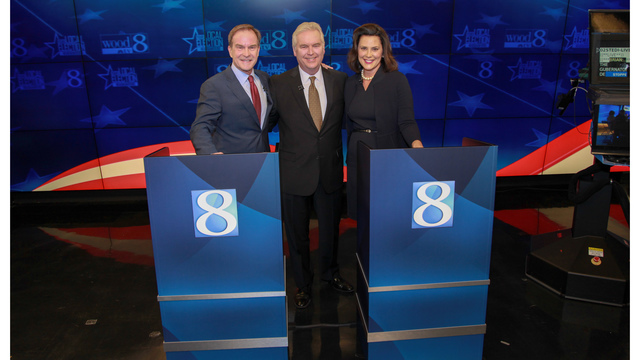 GRAND RAPIDS, Mich. (WOOD) — Only 25 days before voters go to the polls, Michigan gubernatorial candidates Bill Schuette and Gretchen Whitmer debated at WOOD TV8 Friday evening. Both candidates boasted their previous experience in government and promised to make changes to improve our state. They traded the expected jabs on each other's stances on taxes and health care. They were also pressed by 24 Hour News 8 political reporter Rick Albin, who moderated the debate, to provide specifics about how they're going to reform automotive insurance to lower rates and where they're going to come up with the cash to fix Michigan's notoriously bad infrastructure. 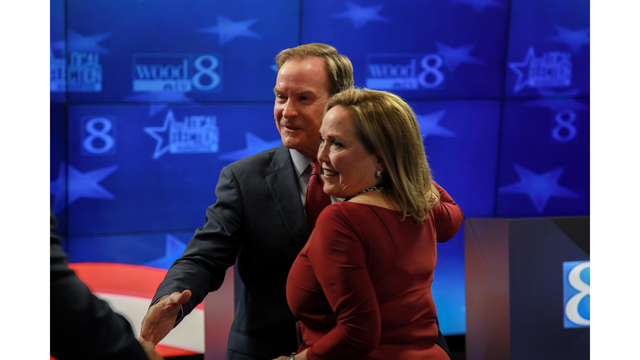 Republican Michigan Attorney General Schuette from Midland, who previously served as an appeals court judge, a state senator, a U.S. representative and the director of agriculture in Michigan, said in his opening statement that he is running because he wants Michigan to grow. "I want Michigan to be jobs state, a paycheck state and a growth state," he said. He said that if elected, he would cut tax increases, lower automotive insurance rates, improve schools, rebuild infrastructure and make health care affordable and accessible. He lobbed insults at former Gov. Jennifer Granholm, whom he blamed for Michigan's recession, and called his opponent's plans "extreme." 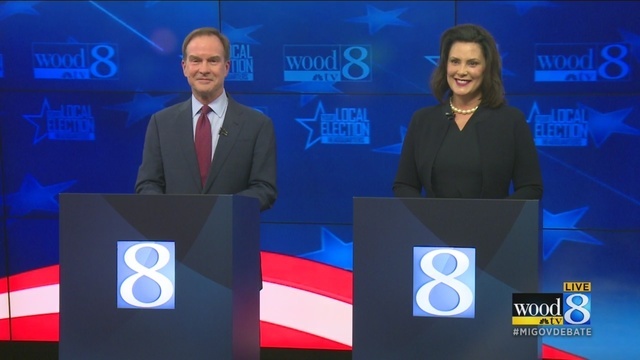 Whitmer, a Democrat from East Lansing, previously served in the state House of Representatives and the state Senate, where she was minority leader, and as the Ingham County prosecutor. She touted successes on health care and the economy while serving in the state Legislature, saying she crossed the aisle and worked with current Gov. Rick Snyder, a Republican who is being term-limited out. 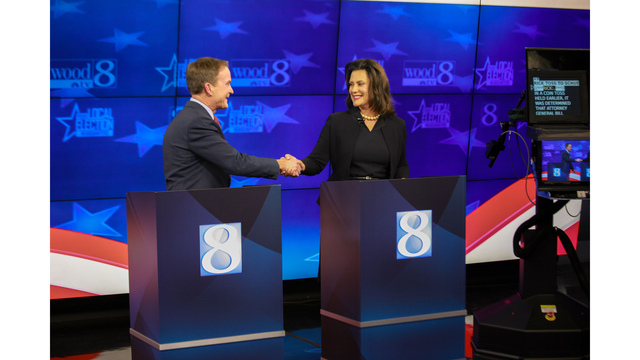 She rejected Schuette's claims about his stances on health care, saying he tried to stop the Affordable Care Act, more commonly known as Obamacare. "We cannot afford to go back. It would be bad for business, it would be bad for Michigan families," she said. that surfaced earlier this week — the timing obviously intentional — showing Bill Schuette making questionable comments before a TV interview in 1989. Neither candidate seemed particularly enthusiastic to talk about it. Schuette said he was embarrassed by what he said was his apparent attempt to be funny, but also said the recording had been "drastically edited" and that its release was a "hit job" by the left. He pivoted to attack Whitmer's running mate, referencing video of Garlin Gilchrist's rental properties, and Whitmer's legislative record and agenda. Whitmer said the video was "bizarre," adding, "I don't know what else to say about it." Regardless, she said she doesn't care about it. She said she wants to stay focused on issues, and took aim at her opponent for his stances on things like the pension tax and health care. She said she would build coalitions to create a "great future." 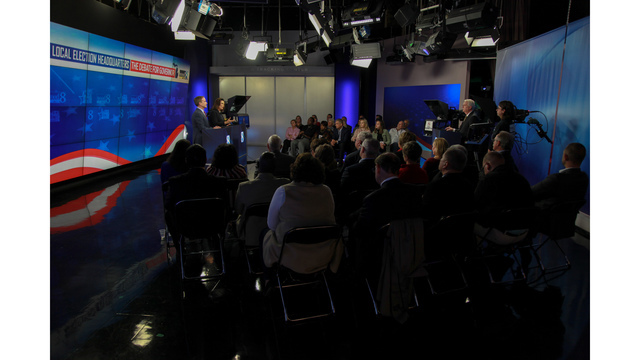 The second question turned the conversation to Healthy Michigan, the Medicaid expansion program that grew from the Affordable Care Act. 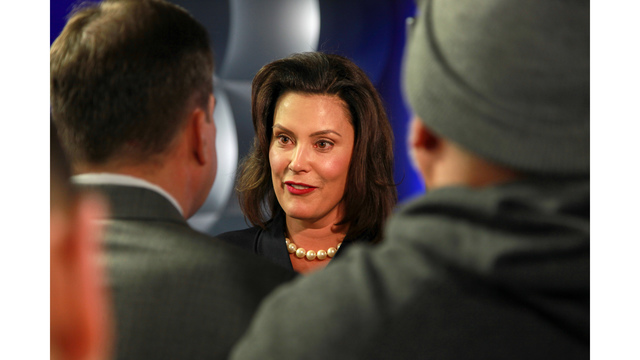 Whitmer promised to maintain Healthy Michigan, saying she partnered with Republicans, including the governor, to move it forward. She said Schuette has tried again and again to repeal the Affordable Care Act, and that if he is elected, patients will be at risk. 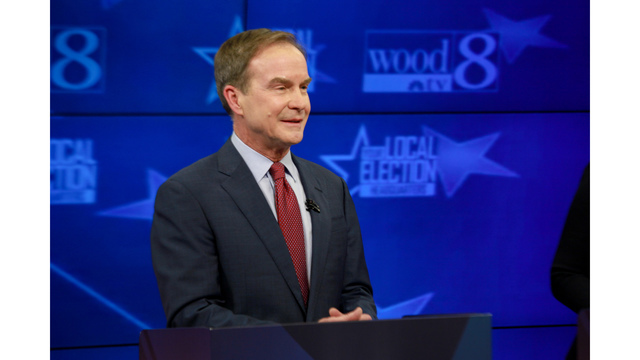 While Schuette admitted he doesn't support the Affordable Care Act, citing the poor exchange and higher taxes, he said he believes in maintaining coverage for people with pre-existing conditions and covering children until the age of 26. He said Whitmer claims to have fought big insurance, but that she's actually "captive" of it. "You've been in office for 33 years and you've never done a darn thing to expand health care for people in this state," Whitmer retorted. "In fact, you filed nine lawsuits to pull it away from people. You attacked your Republican opponent in the primary, (Lt. Gov.) Brian Calley, over and over again for supporting Medicaid expansion. You're still fundraising off of the plan to repeal it." 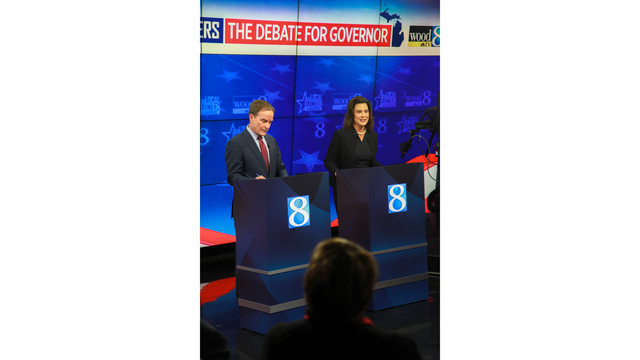 Given a chance to respond, Schuette said that Whitmer's claims of bipartisanship are overinflated. "What you did is work with every Democratic colleague who wanted Obamacare, so that was really not strenuous activity," Schuette said. "The fact is is that Obamacare didn't work. The fact is is that you've received more money from big insurance than anyone running for governor in the last 10 years." numbers in recent years, Schuette said that he would grade schools A through F and give grants to improving schools. He also said he would appoint a literacy advisor to his cabinet to tackle those third-grade scores and create a Michigan Reading Foundation. He added that he wants to create transportation scholarships for students who need to need to travel to attend special needs programs. Whitmer said she has a "cradle-to-career" plan for education. She said that would include tripling the number of literacy coaches, providing universal early childhood education, supporting educators and ensuring that school graduates have a path to a high-wage job. Asked about the lack of skilled trade workers in the state, Whitmer blamed cuts in education funding. She said she would "attack the talent gap" through a "MIOpportunity" two-year, debt-free scholarship program to fund a community college degree or part of a four-year degree, and by making it easier for high school students to attain trade certifications early. Schuette applauded an apprenticeship program in Madison Heights that prepares students for careers. He said students should have be able to gain credit for working. In Whitmer's time in the Legislature, he said, she didn't do anything to expand apprenticeships. 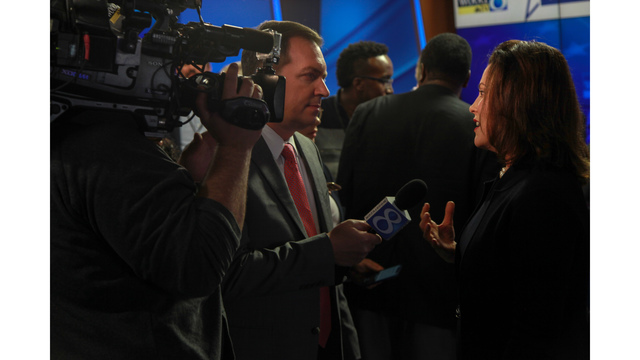 In her rebuttal time, Whitmer ignored the jab and said she wants the Michigan Economic Development Corporation to hold a "52-week jobs blitz so we are throwing shovels in the ground and creating jobs and building here in Michigan." She also said the Elliott-Larsen Civil Rights Act, the state's anti-discrimination law, should be amended to protect LGBT people so the state is more friendly to workers. Schuette said the issue comes down to jobs and progress. He said he would build on the work done by Snyder. 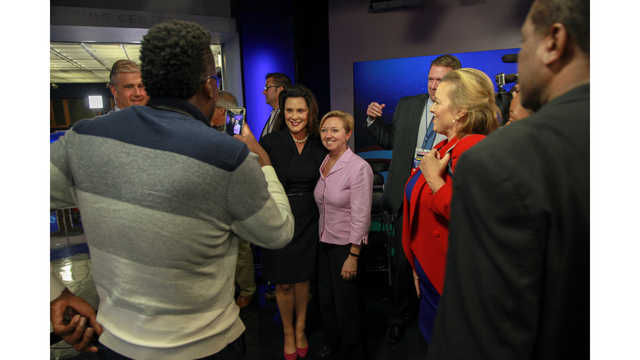 Who do you think came out on top tonight at the #MIGovDebate? that has been found in several Michigan communities. Schuette said that as attorney general, he launched an independent investigation to hold people responsible. Whitmer said she would expedite the replacement of pipes in Flint and reinstitute bottled water distribution until that's done. She said she would also provide "wraparound" support for the children exposed to lead. She also blamed Schuette for not responding quickly enough to complaints from the people of Flint. Schuette said pastors in Flint told him people feel "gut-punched" by state government, and that as governor he would work to restore that trust. "I did the right thing in Flint. Anything else is just nonsense," he said in response to Whitmer's criticism. Whitmer said she didn't care about taking credit on issues and that she's focused on getting things done. Asked about clean drinking water and emerging contaminants, Whitmer said that Michigan has an abundance of fresh water, but too many people are finding out they can't drink theirs. She said that if elected, she would create a state-level Great Lakes and Fresh Water department and put a drinking water ombudsman in her cabinet to act quickly on complaints. She said she would invest in cutting-edge science and partner with universities to tackle water problems. to replace Enbridge's Line 5 to prevent leaks in the Straits of Mackinac. He added that he would refocus the Michigan Department of Environmental Quality to tackle PFAS contamination. lawsuit against 3M, the company that made the Scotchgard blamed as the source of the PFAS contamination in the Rockford area. Schuette said his office is still working to get information from the MDEQ to file the PFAS lawsuit. Turning to Michigan's shoddy roads, the candidates were asked exactly how much more money the state needs to spend on infrastructure and where, specifically, it's going to come from. Schuette said the state needs to do four things: audit how the Michigan Department of Transportation allocates funding for projects; get guarantees and warranties for road and bridge construction projects; access more federal funding (which he said he can do by utilizing his relationship with President Donald Trump); and add to the $1.2 billion the Legislature has already devoted to roads through 2021. Whitmer said it will cost $3 billion to get the roads up to par. She said she would cross the aisle and build coalitions to find that money. 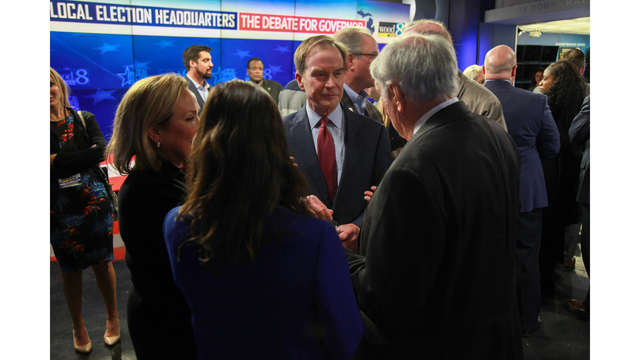 Schuette latched on to that figure, saying Whitmer would have to raise gas taxes to get it. "Every aspect of government will have to contribute to enhance our funding for roads," he said. "But we don't need to raise taxes." "No one's buying it," Whitmer said in response, blaming longstanding Republican leadership for the current state of the roads. She said she would create a Rebuild Michigan Infrastructure Bank funded with $2 billion from the state and $1 billion from the federal government to fix the roads. Asked whether the state has done enough to stop sexual predators, Whitmer said there is "absolutely" more that can and must be done. case was being investigated, her office worked around the clock to find the evidence to put him away. She said she agreed with the decision to pass the case to the Attorney General's Office because that was the right agency to handle it. As a survivor of sexual assault, she said, she has a plan to keep campuses safe, including creating a reporting system and teaching law enforcement to support survivors. Schuette said he made sure that all of the survivors of Nassar's decades of abuse would be allowed to speak at his sentencing hearing earlier this year. He said he prosecuted Nassar and put him behind bars for the rest of his life. He said his office is also investigating institutions to see if anyone else is criminally responsible. He said Whitmer decided not to prosecute and that the case was referred to him by Michigan State University campus police, not by Whitmer's office. Whitmer said he wasn't at her meetings with police and asked him not to "weaponize." He again said she was lying about her role in sending the case to him. Asked whether Michigan law enforcement should cooperate with federal Immigration and Customs Enforcement, Schuette said he supports a "hopeful" and "welcoming" immigration policy, but that everyone needs to play by the rules and there is no room for sanctuary cities in Michigan. He made a series of claims about Whitmer's stance on ICE and her running mate's opinion on the Department of Homeland Security. 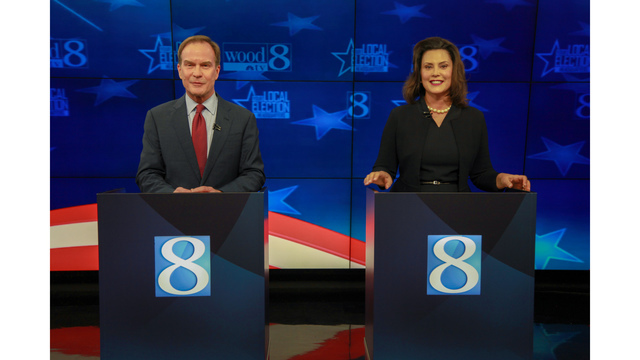 Whitmer said Schuette's claims about her positions were "nonsense" and an attempt to make up ground in the polls. She said the nation needs immigration reform and that Congress and the president should work on a comprehensive strategy. She said Michigan was built by immigrants and that's one of our strengths. She also said she would not stand by while immigrant families are separated and implied Schuette is too beholden to President Donald Trump. In rebuttal, Schuette took aim at Whitmer's running mate Garlin Gilchrist, saying he was anti-Semitic, anti-Israel and anti-Evangelical. 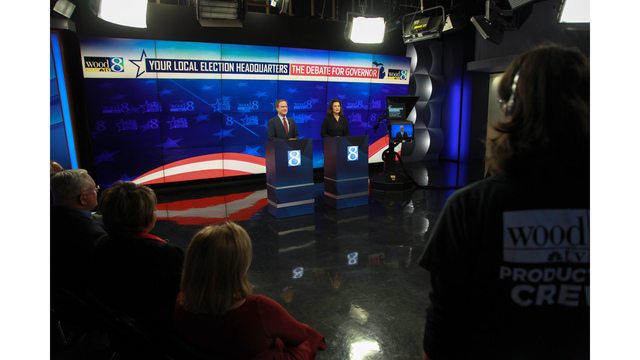 Whitmer said that assertion was also an attempt to make up ground in the race. She said many of Schuette's supporters are anti-Semitic. > 16 Photos >Copyright 2019 Nexstar Broadcasting, Inc. All rights reserved. This material may not be published, broadcast, rewritten, or redistributed. Michigan's no-fault automotive insurance for years, but one after another, proposals to do so have failed. As a result, Michigan drivers continue to pay some of the highest rates in the nation. Asked about how to pressure well-funded stakeholders and the Legislature into action, Whitmer said she wants to sign into law a measure to lower rates within her first six months in office. The way to do that, she said is cost containment. Her steps to do that include fighting fraud, forcing insurance companies to pay their bills on time and treat policy-holders fairly, making the Michigan Catastrophic Claims fund more transparent while continuing to protect people seriously injured in car crashes, and stopping "red-lining," which allows rates to be influenced by a variety of socioeconomic factors. Schuette said the state needs to stop fraud, stop frivolous lawsuits, and give people options and choices for coverage. He said Whitmer never managed to do that while in office and her running mate doesn't have any experience in the Legislature. In rebuttal, Whitmer said Schuette had the chance to make change as attorney general by suing for price gouging, but that he didn't. Instead, she said, the governor started an anti-fraud authority. "Give me a break, Bill. If you'd been doing your job before the cameras showed up, people might have better rates right now," she said. Schuette turned back to his key talking points: cutting taxes, lowering rates and moving forwarding, and referencing Granholm again. ), the candidates were asked to explain their stance on the issue. that is causing overdose deaths to rise. He said he thought legalization would put more drugs in the hands of kids. 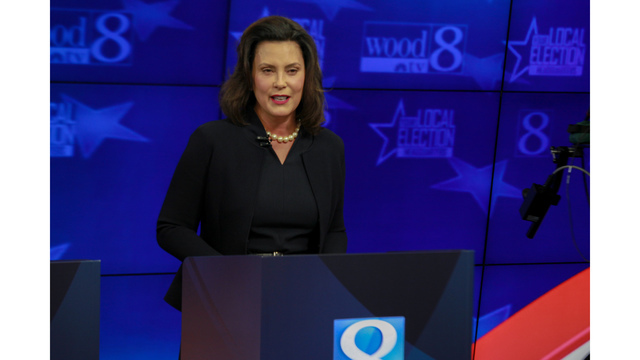 Whitmer said she supported medical marijuana when it was legalized by ballot initiative, but that Schuette fought against making that law practical. She said she would vote yes on recreational use and that as governor, she would make sure the money gained by taxes it goes to schools, infrastructure and health care. 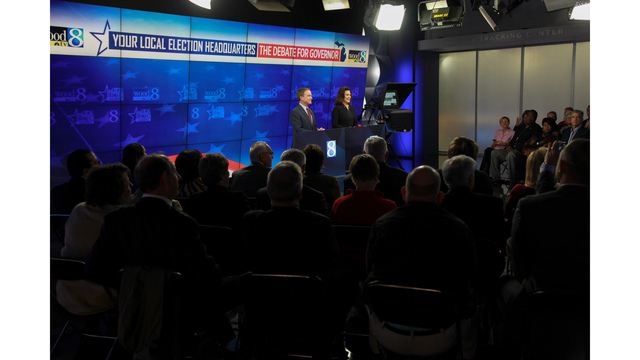 The debate closed with what's often a deciding factor for voters: taxes. Whitmer promised to repeal the income tax on pensions that is hurting seniors. Schuette said he also opposed the pension tax and wanted to repeal it. 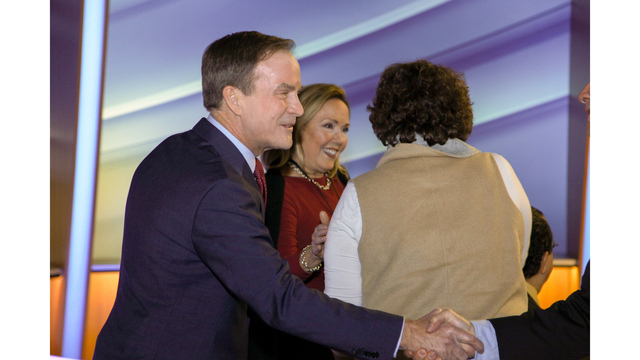 In his closing statement, Schuette said the election is about more than him and Whitmer: it is about the people. "We can't afford to go back. We have to go forward," he said, and argued he has the record, skill set and experience to make that happen. He again said his agenda was about more jobs and bigger paychecks, and promised to cut taxes, lower auto insurance rates, improve schools, fix the roads and make health care accessible. He said he was optimistic about Michigan's future and said he wants it to be a good place for families to put down roots. "Michigan, we can win again, and we will," he said, referencing his connection to Trump. Whitmer said these are precarious times for the nation, but that we can turn it around. She said she wants families to stay in Michigan and more people to come here, but that we can't do that if we avoid dealing with problems like poverty, tainted drinking water, underfunded education and bad roads. "I've put a real plan on the table to fix the damn roads," she said. "Bill Schuette's plan is two steps: Get elected and then figure it out. We deserve better and we can do better." She again promised bipartisanship if she is elected. "If you're ready for a governor who knows how to roll up her sleeves and tackle tough issues, build coalitions to do it and who will govern for us all instead of just the few, I hope you'll vote for me on Nov. 6," she said. Speaking to 24 Hour News 8 immediately after the debate, Schuette said he thought he got some good hits in. He listed some of his successes in public service and said his candidate didn't have the same record. He said he was confident in a win once the votes are tallied. showing her with a lead of several points. Before the debate, several protesters gathered outside WOOD TV8's studio in the Heritage Hill neighborhood. They held signs in support of Whitmer and Gilchrist, an unflattering effigy of Schuette, and a cutout showing an image of Schuette from the 1989 video. 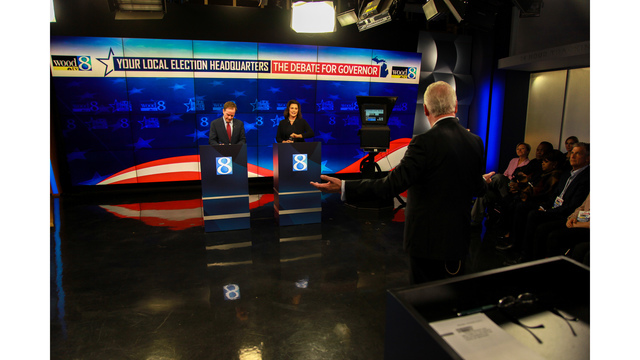 A second guberntorial debate will be held at WDIV-TV's studio in Detroit on Oct. 24 at 8 p.m.
laid out by its ownership group, Nexstar Broadcasting Inc.